For years, one 3D printer manufacturer dominated the world of fused deposition modeling (FDM), specifically in the industrial space. More recently, however, several manufacturers have come forward with systems capable of printing with powerful, engineering-grade materials. Among the first in this new generation of industrial FDM machines was an Italian company called Roboze. 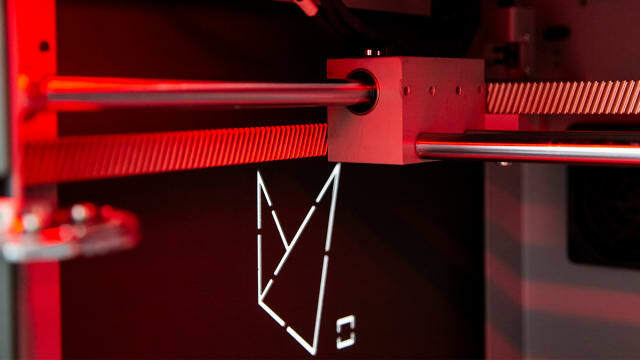 With the launch of the Roboze One+400, the company initiated a breed of 3D printers capable of printing with such sought-after materials as polyether ether ketone (PEEK) and ULTEM, but at a much lower price than the name-brand 3D printers more familiar to the 3D printing industry. At formnext 2018 in mid-November, Roboze will launch a new series of mid-range, office-friendly 3D printers with similar material capabilities, thus bringing engineering-grade plastics to small and mid-sized businesses. To learn about the company’s latest Xtreme series of machines, we spoke to Roboze CEO Alessio Lorusso, who was able to explain some of the more unique features behind patented Roboze technology, as well as new materials to be released with the Xtreme systems. Roboze was founded by Lorusso in 2013, with the company working on its initial product, the Roboze One, which it launched in 2015. Two years later, the One+400 printer was released. As mentioned, the Roboze One+400 added the ability to process one of the strongest plastics, PEEK, to desktop 3D printing without the same price tag as name-brand systems. Key to this capability is the fact that the machine can reach 500°C. Then, in 2017, Roboze launched the Argo500, which expanded on the company’s foundation technology by increasing the build size to 500mmx500mmx500mm. While these machines can process PEEK and other high-temperature polymers, not every part manufacturer needs the capabilities that they offer and, because PEEK and ULTEM are more expensive plastics, some companies may prefer both a more affordable machine as well as the option to use more affordable materials. For this reason, Roboze is introducing the Roboze One Xtreme and Roboze One+400 Xtreme editions, which the company describes as “desktop production” systems. The biggest distinction between the One Xtreme and One+400 Xtreme is that the extruder on the One Xtreme, like the original Roboze One, can only reach 300°C, whereas the One+400 Xtreme can reach 500°C, opening up a greater range of engineering-grade materials. What distinguishes the Xtreme series as a whole from the original Roboze series are a number of unique features that increase the machines’ accuracy and repeatability, as well as improve their ease of use. Among the new features is closed-loop quality control, something that’s difficult to find in many 3D printing systems. “We have a system on the motherboard where it checks in with the motors every moment to determine their location and if they are in accordance with the gCode from the software,” Lorusso explained. If the motherboard detects that the motors are going to move out of sync with the original gCode path, it will correct their movement, ensuring accuracy and repeatability. This complements Roboze’s patented beltless technology, which has been standard on the company’s machines since the beginning. Lorusso described the difference between the racks and pinions associated with his machines, as compared to the ubiquitous rubber belts found on nearly every other FDM system. While all Roboze systems feature this beltless system, the Xtreme series introduces a unique vacuum plate technology that we have yet to come across in the world of 3D printing. Typically, before beginning a print, the user must apply a special film or glue or some other material to ensure that a print will adhere to the bed. Once the print is complete, the plate is removed and the printed object is scraped off of the platform using a metal spatula. Roboze replaces this difficult, time-consuming process with its vacuum system. During this process, the aluminum plate is fixed to the bed, above a vacuum. With a flip of the switch, the vacuum is turned on. A specialty film is placed on the platform, and the vacuum keeps the sheet in place. Because the sheet is made in part from the same chemistry as the material that will be deposited into the machine, a different film for each given material, adhesion between the first layer of the print and the specialty film is “perfect,” according to Lorusso. Once the print is complete, the vacuum is switched off, freeing the film and allowing the user to simply pick up the print attached to the sheet below it. Not only does this process save time, but it also ensures further accuracy and repeatability because the user never needs to recalibrate the bed, since it is fixed in place. Other new features include a redesigned casing; the addition of nickel plating to the beltless system to reduce friction and corrosion while increasing speed; Wi-Fi connectivity; and the introduction of optical, touchless endstops to reduce the possibility of failures associated with mechanical endstops. 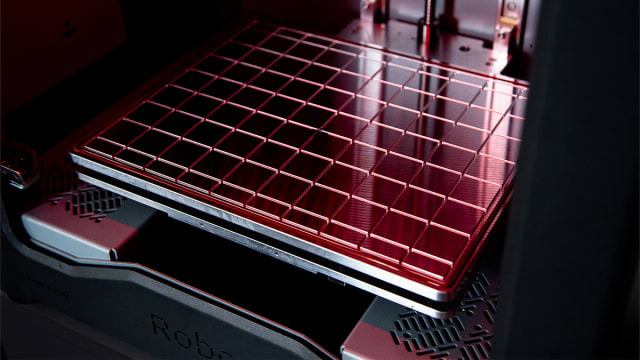 Along with the launch of its Xtreme series, Roboze is announcing new materials that are compatible with these machines: Glass PA, PP and Carbon PP. The company is also releasing Carbon PEEK, available only for the Roboze One+400 Xtreme and the Argo500. Glass PA is a polyamide (Nylon) filled with glass particles, resulting in a material with enhanced mechanical properties and decreased humidity absorption when compared to standard nylon. This makes for improved dimensional stability and electrical insulation. Lorusso pointed out that Roboze already offers Carbon PA, made up of 20 percent chopped carbon fibers, which he said “has the best mechanical properties” in the 3D printing plastics sector. With tension strength of 140 MPa, Roboze’s Carbon PA nears the strength of aluminum. The carbon fibers, however, make the material electrically conductive. PP is polypropylene, which is meant for the production of commodity items and automotive parts, as it demonstrates high impact abrasion, resistance to chemicals and good electrical insulation. Carbon PP has the same performance as PP, but with the added benefits of carbon fiber, including 25 percent greater corrosion resistance. This makes the material ideal for automotive applications. 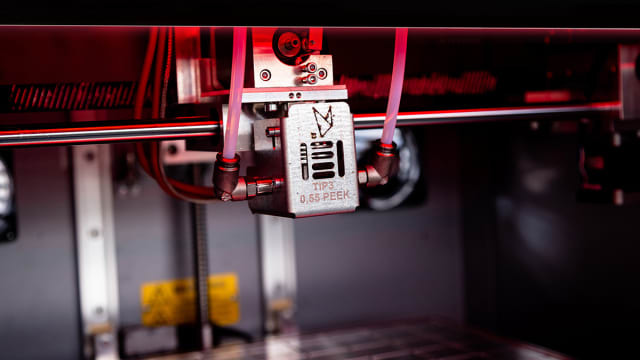 Roboze has pursued advanced polymers like PEEK in order to replace the need for metal in some business operations. For this reason, the company developed Carbon PEEK, which adds even greater thermal stability and rigidity to PEEK. Both the Argo500 and One+400 Xtreme can process this material, giving medium-sized businesses access to a strong plastic that provides enhanced thermal and chemical resistance. According to Lorusso, about 50 percent of Roboze customers are in the aeronautics space, followed by motorsports, oil and gas, and the plastics industry. Roboze machines are typically used for specialty end parts and small batch production of 2 to 5,000 parts per year. Some applications include the replacement of traditional manufacturing methods, like compression molding and injection molding. Perhaps most interesting is the technology’s use in composite molding, which is common in aerospace and motorsports. “The customer will use our machines to produce the molds, which are then laminated on top of carbon fibers. Then, they put everything in the autoclave [at] 180°C to obtain the final carbon fiber laminated part,” Lorusso explained. Roboze has found itself working with a variety of businesses, including some of the largest in manufacturing. These include familiar names such as GE and Airbus, as well as defense companies like Rafael and Formula 1 teams. However, these firms have access to far more resources than smaller businesses. The introduction of the Xtreme series and these new materials are meant to open industrial FDM technology to small and medium-sized companies, according to Lorusso. The Xtreme series, along with these new materials, will be showcased at formnext 2018 on November 13, at booth C78- 3.1. If you’re at formnext, you can learn more by stopping by the booth. Otherwise, visit the Roboze websitefor more information.